New York: Oxford, 2003. 304 pages. $25.00. 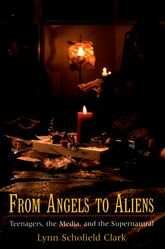 Lynn Scholfield Clark’s 2003 book, From Angels to Aliens: Teenagers, the Media, and the Supernatural, attempts to parse the implications of the growth in supernaturally-themed entertainment media for the religious beliefs of teenagers. Drawing her observations from interviews conducted with one hundred teenagers and their families from the southwestern United States, she ultimately claims that teens tend to have an “openness to possibility” (228) of the supernatural that is influenced less by their choice in entertainment media than by their family tradition. Although Clark’s interviews often centered around now dated series such as X-Files, Buffy the Vampire Slayer, and Touched by an Angel, the growth in supernaturally-themed entertainment media is no less – and perhaps more – prominent today. The past six years have seen the continued proliferation of television series such as Heroes and Lost and the huge box office success of The Dark Knight and Iron Man. If one wonders about the continued relevance of Clark’s work, then one needs only to look at the New York Times Bestsellers list from earlier this year to note that at one point Stephanie Meyer’s teen vampire series, Twilight, occupied four of the top five slots. Thoughtful research and reflection about the implications of these increases for the faith lives of teens seems more relevant now than ever before. An Associate Professor and Director of the Estlow International Center for Journalism and New Media at the University of Denver, Lynn Schofield Clark has completed several additional books and articles since writing From Angels to Aliens that continue to trace the connections between media and religious practice. In this book, she attempts to ascertain whether there is a connection between openness to belief in the supernatural – possibly evidenced by the rise in ghost, angel, and alien-themed entertainment media – and openness to belief in organized religion. She offers five possible categories of openness into which the teens she interviewed tended to fall: Resister, Mystic, Experimenter, Traditionalist, and Intrigued teens. The teens in each category were heavily influenced by their families of origin (either correlationally or compensationally), and there was relatively minor distinction across class and race boundaries. The categories are not meant to be normative. Nor does Clark assume them to be complete. They rather surfaced for her as a result of this particular ethnographic research. They operate on a continuum of openness that ranges from those who have high belief in the possibility of the supernatural and very low belief in organized religion (Resisters) to those who have the opposite inclinations (Traditionalists). Clark admittedly did not spend much time addressing those teens who profess no belief in either the supernatural or organized religion as that viewpoint was virtually non-existent in her research sample. What is interesting about each of these categories is that many of the teens’ supernatural understandings about guardian angels or ghosts rely on certain religious assumptions that may not be obvious to those expressing those beliefs. Thus, a Traditionalist teen – who seeks to protect the boundaries between religious faith and “secular” media – has little problem discussing her supernatural understandings of angels, because she can find a place for them within the canonized structure of her tradition, but aliens become problematic for her. On the other hand, a Resister teen – who despises organized religion – might say he does not believe in God, but has no problem with guardian angels. Both share an openness to the possibility of the supernatural, but their expressions of it differ greatly. The main strength of Clark’s work is the detailed description of the five categories of openness through the use of particularly edifying examples from selected interviews. She effectively uses a qualitative research methodology that, by its nature, was not designed to make sweeping normative claims, but allows her to begin to understand a particular phenomenon through the eyes of several teens and their families. An additional strength of this work is an auxiliary claim Clark makes that connects the rise of the supernatural in entertainment media and the rise of evangelicalism in the United States. She shows how the focus on the “darker side of evangelicalism” (for example, demons, the devil, the threat of hell) opened the door for media outlets to use “darker elements,” like teenage vampires, to make counter ideological and moral claims about these elements of the supernatural. The chief challenge of this book is its scope. As a practical theologian, I am interested in not simply the descriptive and interpretive aspects of a research project, but also the normative claims that the author makes and the strategic suggestions that result. In some ways, this book felt like the first half of a larger practical theological project. In the end I was left asking, “To what end?” It would have been helpful for the book to have spent more time making some suggestions about right practice with teens either from the standpoint of the media or from that of organized religion. Another challenge of this book is that the polemical quality tended to overshadow the main argument about the “openness to possibility” that exists amongst teens. As much as I agree with her stance against evangelicals who hold up a crucifix at the first sign of the supernatural in popular culture, this viewpoint at times takes on more prominence than necessary and keeps her argument from being clear and concise. This book is helpful for what it begins to do. It ends by making a fascinating claim about the “openness to possibility” of teens to the supernatural, but spends very little time unpacking the implications of that statement. Clark’s discoveries about the influence of the media on the faith lives of young people begin to shed some light on why teens might be so attracted to the supernatural, but ultimately leave it to the reader to draw the practical implications. Nonetheless, From Angels to Aliens would be particularly helpful for those who currently or plan to minister with youth. After all, Clark has helped us to see that there is something compelling about the supernatural for teens. Now our job as the church is to figure out what that means for us.